Here in the UK we are experiencing cold, wet and stormy weather, which has been causing great suffering and misery for many. At a time of celebration, reflection and renewal, many thousands of households are without power and are struggling simply to find warmth. My heart and prayers go out to all of them. At this time of year, when the days are short and the sun only appears for what seems like a few fleeting hours, I often think of summer, and especially all the magical, spiritual moments I have been blessed to enjoy over the years. 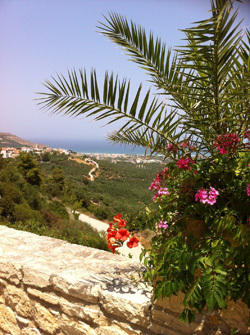 In summer or autumn each year I run my Angels Abroad retreat in West Crete. I always enjoy it. I always learn from it. I meet wonderful people some of whom are new to me and others are old friends. But the main thing about these retreats is the experience of sharing spiritual growth and healing. For the teacher or facilitator the weeks contain hours of preparation and planning, which when done successfully come across as relaxed and easy going… after all everyone is on holiday aren’t they? People come along with different needs and expectations. For some the whole idea of a retreat, or a spiritual holiday is new. Many participants, over the years, have brought pain to be healed, disease to be addressed and issues that need releasing. In the safe space, relaxed atmosphere and expert guidance of a retreat we can look within ourselves with more clarity, more depth and hopefully more honesty. Without exception I can honestly say that over the thirteen years I have been teaching lovely people on my Angel retreat in Crete (and sometimes twice a year) I have always deepened my own growth and understanding while supporting others along their own self discovery. After all, as I keep saying: ‘the teacher often teaches what the teacher needs to learn’! This year was no exception and I had some amazing spiritually uplifting moments while we were visiting the sacred caves of the hermits and sacred areas in the rocks which have now been built into churches. In one beautiful modern church I was standing under the light of the stained glass window and felt a powerful presence which was overwhelming. When my friend Juliet showed me the photo she had taken we remarked on how the green light had fallen across my heart chakra and the red light towards the sacral and root. Quite a powerful healing gift I would say! Others felt something similar and many of the group either sat silently, not wanting to leave, or wandered between the icons with tears in their eyes. There was something special happening throughout the morning, which although we could not explain in words, we all felt in individual ways. Group retreats are always different. Dynamics can change depending on the character and personality of each of the participants, but whether peaceful, challenging, demure or hilarious, each retreat is always another step towards our spiritual goal… and always, without exception, nourishment for the soul.